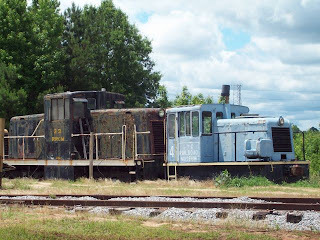 This past Saturday, Tom and I took the boys and his parents to the South Carolina Railroad Museum in Winnsboro, South Carolina (in the vacinity of Columbia). It's was about an hour and half drive from the house, and since they offer hour long train rides, it seemed like a good substitute for A Day Out With Thomas (also last weekend at Tweetsie Railroad) which was three and a half hours away and cost three times as much. We went for the train ride, not imagining that Sam would really care all that much about museum exhibits. We also learned that the museum is non-profit and 100% volunteer run and donation funded. Considering the expenses involved with buying trains and maintaining a museum, I was blown away with all that they've accomplished so far. 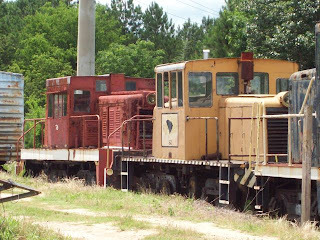 They had many, many engines and rail cars in the yard that members were refurbishing, and have big plans for the future. Right now, they have five miles of useable track, which they hope to expand someday to eleven miles. It'll cost upwards of a million dollars though, and in this shrinking economy, the money for that is not exactly rolling in. 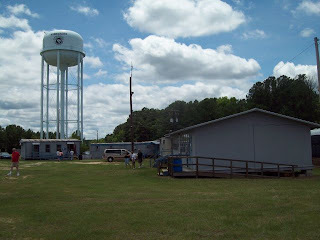 During our train ride, we saw a historic building along the rail line that will be home to the new museum. In the future, you will be able to board a train that will drop you off at the museum and picnic area. That will be very cool. 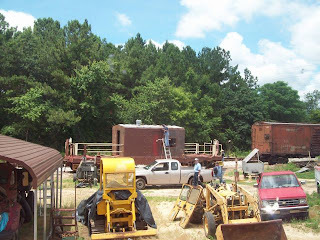 I never chose to be railroad crazy, but I am learning to love trains because Sam does, and I was really moved by this obvious labor of love on the part of all these volunteers and museeum members. They want to accomplish so much with such limited means. I want to help them. Sam is having a railroad-themed birthday party this year. And we are swimming in toys that he will eventually outgrow. I don't think he's going to outgrow his love for trains any time soon and it will be more meaningful to him to have an amazing museum to visit for years to come. 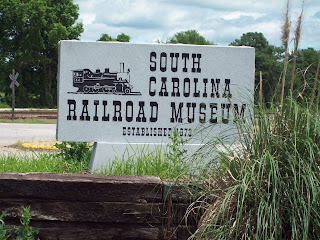 So, for his birthday, I'm going to ask our family and friends to consider making a donation to the SC Railroad Museum in his honor. i bet sam had a great day!